Oh the absurdity of it all! The last round of Fed rate hikes began early 2004 and ended in the middle of 2006. One of the primary justifications for a number of mini-rate hikes was the ominous threat of an outbreak in price inflation. So what magic genie was the Fed trying to keep the lid on? If the numbers were really as benign as they seemed where was the risk of an inflation epidemic coming from? The answer was an incessantly rising CRB index. Commodities were advertising for all and sundry that new money was increasingly flowing into raw materials and ultimately consumer prices. So the actual inflation gauge used by the Fed to justify rate increases was commodity price inflation -- and rightly so. So where's the irony you ask? Fast forward to today and we have even hotter commodity prices – Oil in the $90s – and yet the Fed is cutting interest rates. Say what?? In fact and in spite of $90+ Crude Oil, Inflation expectations as measured by the spread between Treasuries and Inflation Protected Treasuries are at their lowest in at least 3 years. 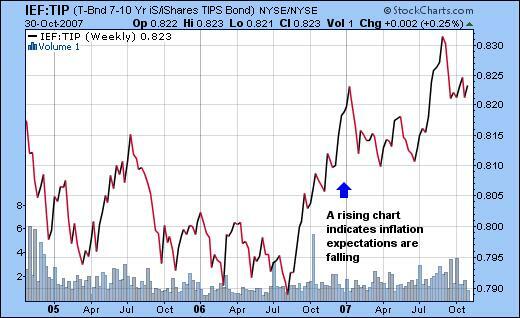 Chart 1: Spread between Treasuries and Inflation Protected Treasuries (TIPS) has been narrowing – chart rising – indicating inflation is not considered a problem. On the face of it all this monetary stimulus has had very little inflationary effect on US consumer prices. Thus we ask the question, where has all the money gone? If energy is the focus then the large Oil producers should be making out like bandits right? 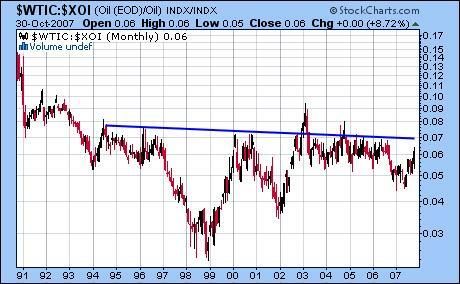 The answer is that Oil Producers are making money hand over fist but based on the above ratio of Crude to Oil Stocks, investors prefer buying Crude directly -- a move above 0.07 would really accelerate that trend. Put another way, the increased margins from higher Oil prices are being eroded by higher production costs. Read as wage and raw material inflation. 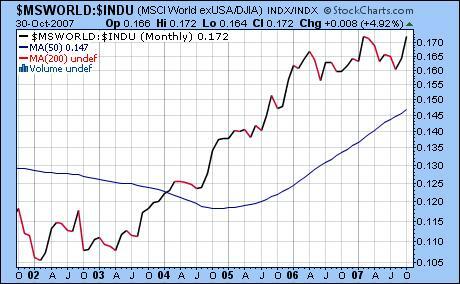 World Markets ex USA have handsomely outperformed the Dow for over 5 years but not without repercussions. Consumer prices in foreign lands – from personal experience Australia and South Africa – are growing out of control. Financial centers such as London or Sydney are now virtually unaffordable due to the high property: income ratios. The answer then to this inflation conundrum ie. the fact that the Fed can reduce rates in the face of scorching commodity prices is that the price inflation immediately runs abroad where it generates growth but also causes havoc on consumer prices. Whilst in the US increased monetary stimulus is going toward keeping an over-valued Real Estate market afloat and not contributing in any material way to the cost of living. The net result for foreign contrarians is that the US assets are probably way to cheap relative to the local market and won't be for much longer. We're buying US small caps.